[Free Gift] Your Brilliant Bio Template - Coach & Grow R.I.C.H. Today I have a special gift for you that will make it fast, easy and fun for you to upgrade one of your most important client attraction tools: your bio! It’s called “The Brilliant Bio Now Template” and it’s from my good friend and a member of my guest faculty, Nancy Juetten. Get your Free Brilliant Bio Template here. This template is the go-to guide that thousands of coaches, authors, and speakers have already used to make their bios rock and attract premium clients. Click here to access yours. It’s a gift! Just fill in the blanks with your objective in clear focus, and you’re golden. Nancy is even offering more “bio support” in her upcoming LIVE webinar that I encourage you to check it out. 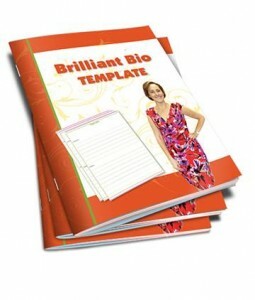 Go get your Brilliant Bio Template here and marvel at how brilliant you truly are!